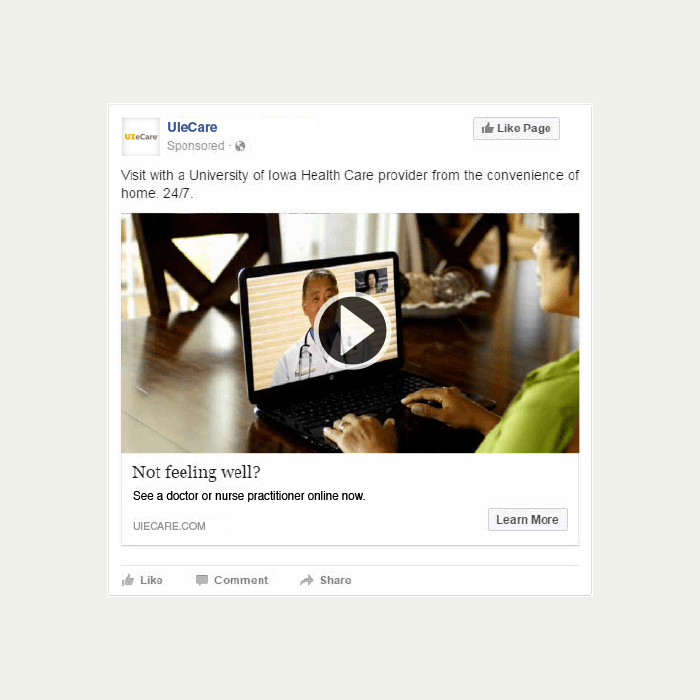 UIeCare is a virtual health care service provider associated with the University of Iowa Health Care system. 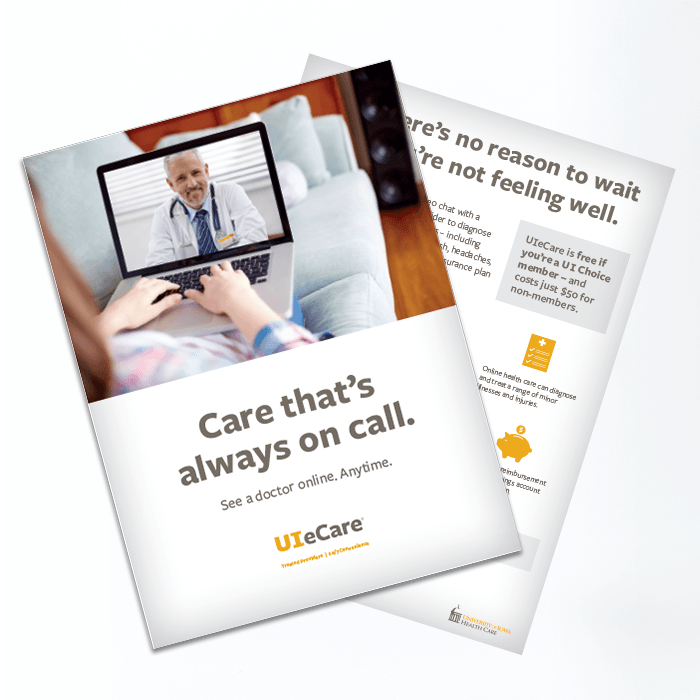 UIeCare, backed by University of Iowa Health Care, allows Iowans to visit with a medical provider via a laptop, smartphone or tablet from nearly anywhere in the state. In promoting this service, Meyocks faced the challenge of helping them market a relatively new and unfamiliar concept to the marketplace. 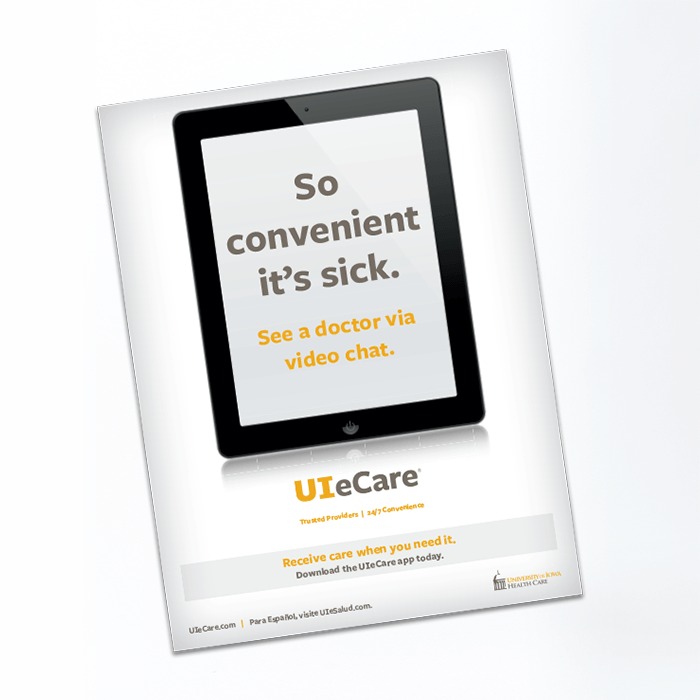 Research conducted by Meyocks on behalf of UIeCare revealed that more than half of people surveyed were unfamiliar with the concept of virtual health care. Once the service was explained, however, convenience emerged as the most appealing attribute. In addition, 70 percent of people with children had sought care appropriate to a virtual visit for a child in the past 24 months. Based on this, Meyocks recommended targeting moms with young children. The promise: With UIeCare, moms and their children can get quality care without leaving home. The integrated marketing communications plan included a launch campaign to convey this promise via out-of-home advertisIeCare agreed that it was essential to educate the consumer on the nature of service. Using repetition of visuals and wordplay, the spot reinforces that patients can see a doctor online — and the doctor can see them, too. The spot closes by highlighting the innovative nature of the service through the father's perspective — showing how its novelty captures his attention, to his own mild detriment. Along with the awareness-building portion of the campaign, a digital customer acquisition program — including paid search, display advertising and sponsored social media posts — was developed and executed to induce trial. As the cold and flu season approached, a secondary campaign — utilizing out-of-home, paid search and display advertising — was introduced to the marketplace to further induce trial while customers would be most receptive to the message of convenience. The initial broadcast run of the spot has generated two million impressions among the target audience — and continual optimization of the digital campaign was able to lower the cost-per-acquisition average by nearly 50 percent. A supporting campaign was developed targeting employees of the University of Iowa and community members in Johnson County.